After a trio of hot, hyped and now very hard to find releases, Voyage return with a fourth release from an until now unknown artist. 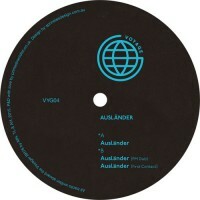 Unearthed from the hull of an abandoned discovery probe, the origins of Ausländer are undisclosed and unlikely to be uncovered, but the three artifacts here revolve around what is only understood as "Ausländer's Theme", which is twice reinterpreted on the flip. I couldn't tell you whether he's man or machine, but there are some seriously cybernetic vibes emanating from this galactic wax. Picking up distant radio frequencies, the main mix on the A-side finds Ausländer weaving a space age bass arp around a snapping electroid beat, setting the scene nicely for the celestial keys, UR pads and blistering synth lines which follow. 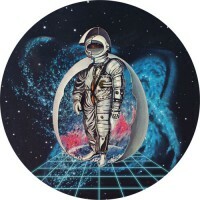 Unhurried, cosmic and killer dancefloor vibes for the star gazers and ravers. Over on the flip, the "PM Dub" finds our hero locked into a death duel with a robotic proto house groove, reshaping elements of the original into a wall shaking, retro-house rocker complete with growling bass, squealing guitar and plenty of headfucking sample abuse. Closing the set out nicely, "First Contact" safely carries us into the star child's protective bubble to the sounds of misty pads, relaxed synths and gentle guitars - cosmic? Balearic? Brilliant! Undoubtedly beamed back from the future, this wondrous exploration of thought, rhythm and undiscovered worlds is a welcomed addition to the Voyage catalogue.